I just got done writing a tutorial on how to add ruffles to a peyote stitch band, so I figured I would try a similar technique with brick stitch. My favorite type of brick stitch is circular brick stitch, and I am generally pretty fanatical about trying to keep my circles even and flat. I really welcomed this opportunity to try and make my brick stitch wavy around the edges and not even in every way. For this project, I used a combination of 11/0 Miyuki Delica beads and 11/0 Czech beads. The center of the flower is a 4mm round faceted glass bead. I used Nymo size D thread (on a cone) and a Tulip beading needle. I chose to use the Delica beads as the first three rounds of beading so that there would be many spaces (bridges) to stitch into for the later rounds when I wanted to make it ruffled. I'm not sure if that is a requirement for this design, but it worked. To start circular brick stitch beading, pick up the 4mm round bead leaving at least a 6 inch tail. Stitch back through the bead two more times, placing the thread loops on either side of the bead. I actually like to go around the bead two times since it seems to hold the beadwork more tightly around the center bead. Pick up two beads for the first round of circular brick stitch. Stitch under the thread bradge around the bead from the back side to the front. Separate the beads and push the delica beads flat against the center bead. Stitch back up through the last bead you added to secure them both in place. Pull the thread taut and adjust the beads. 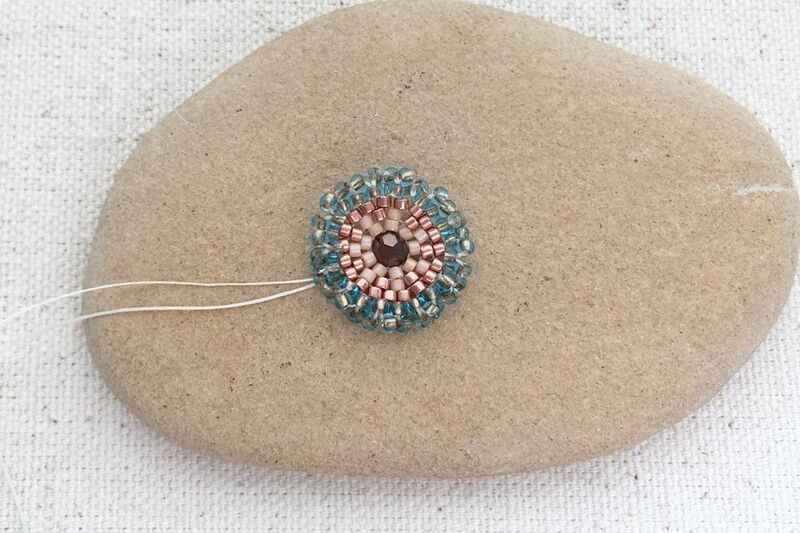 Continue stitching around the center bead, adding a single bead at a time for the rest the round. When you get to the end of the round, be sure not to add too many beads that might cause the beadwork to buckle at this point. The first few rounds are smooth - the ruffles will be created on later rounds. To close the gap, stitch down through the first bead on the round, under the thread bridge and then back up the same bead. This will position you to start the second round of beads. Add two more rounds of brick stitch following the same basic instructions. Start the first stitch of each round with two Delica beads and then add one bead at a time for the rest of the round. Similar to the peyote ruffle, the brick stitch ruffle is actually multiple picot edge stitches that overcrowd the edge causing it zig zag and ruffle along the edge. To start the picot, pick up three size 11/0 Czech seed beads. Stitch under the thread bridge and back up through the last bead added. This will form a small triangle. Refer to this tutorial for a more detailed view of adding a brick stitch picot edge. Move to the next thread bridge and add another picot by picking up two beads and stitching up through the last bead added. To make it ruffle, you will add another picot stitch into the same thread bridge opening. Pick up two more beads, stitch back into the thread bridge you just stitched into and back up into the second bead you just added. Make sure the beads lay flat against the center beadwork (they will align in front or behind the previous picot stitch). Continue alternating two picots stitches in a bridge with one picot stitch all the way around the brick stitch. To complete the round of picot stitch ruffle, pick up one bead and stitch down into the first bead on the round, through the last thread bridge and back up the first bead on the round. This will complete the round of ruffle brick stitch. I have not experimented with adding multiple rounds of brick stitch ruffle yet, but I am sure it is possible. My plan is to use the ruffle brick stitch flower component as part of a clasp on the peyote ruffle bracelet band. One side will have the brick stitch flower, while the other side of the peyote band will have a bead loop. The ruffled brick stitch components will also look great as earrings or a pendant.